Musical Fidelity is taking on the high end at its own game, whilst lowering the price of entry. Take the new M6PRE and M6PRX preamp and power amp combo, for example: balanced inputs and outputs (including USB); high-quality MM/ MC phono inputs; 260 watts per channel; a regulated power supply system and (claimed) low distortion levels are impressive credits indeed. And, unlike similar products, this duo is 'high end' at a more realistic price. Well, okay, they're not exactly cheap, but look around at the high end and you'll see that there's a lot on offer here. The real question here is – can Musical Fidelity's M6 components really offer a challenge to extravagant price-no-object kit? As already stated, the M6PRE and M6PRX offer fully balanced circuit topology. It's an operation that's maintained throughout, although not all 'balanced' amps offer this. With many, the circuits themselves are single-ended with balanced inputs and outputs. While this gives some improvement over plain single-ended, maintaining balanced throughout is better. The M6PRE has single-ended inputs for CD, tuner, tape (with monitor), Aux and MM/MC phono stage, plus two balanced line inputs and a USB input. A choice of balanced or unbalanced outputs is offered. Virtually no 'extras' are included – so, no stereo/mono switch, no phase-reverse button and no left/right balance control. The M6PRX is a dual-mono, stereo power amp offering 260 watts per channel into eight ohms. Musical Fidelity claims the amp can deliver significant levels of current (around 140 amps), with a peak voltage output of 130 volts. There are two pairs of single-ended line inputs (switchable), plus a set of balanced inputs using XLR plugs. Loudspeakers are connected via two pairs of 4mm sockets/binding posts. Distortion levels are also very low. With the power amp, typical THD with-noise is less than 0.003 per cent from 20Hz to 20kHz. Noise is less than 120dB (A weighted), so you could use this amp with sensitive speakers and not have issues with residual hiss or hum. Musical Fidelity claims the M6PRE has less than 0.005 per cent distortion, with self-noise measuring around 96dB (A weighted) and, via its balanced outputs, a maximum of 19V RMS (52V Peak) – with these figures being halved for the single-ended outputs. Specifications such as these promise high-end performance. Faint buzz Musical Fidelity's expensive components – like the Titan and AMS series – are built in the UK. The M6 line is manufactured in Taiwan, enabling worthwhile cost-savings, without significantly compromising performance or build quality. Both M6 items are very well finished, feeling solid and confidence-inspiring. The casework features a combination of alloy (front and side-plates/heat sinks) and steel (top and bottom sections), compared to the all-alloy construction of the Primo. The latter's 'lustre' surface finish is, perhaps, a touch more stylish and expensive-looking than the M6's matt finish, but any preference here has to be personal. The various knobs and buttons have a nice solid 'feel'. The volume control is smooth and well-damped, while the various press-buttons are tactile and positive. A faint buzz from the M6PRX's mains transformers can be heard with an ear close to the amp's casework, but the preamp is virtually silent. During normal use, the PRX's casework does get warm to the touch, but it doesn't run hot like MF's big Pure Class A power amps. The design is a dual-mono type and (unusually) Musical Fidelity employs bifilar choke-regulation in the power supply to improve performance – something rarely seen nowadays. Indeed, Musical Fidelity believe that choke regulation has not been used in any hi-fi transistor design – though it was fairly common with old tube amps. Interestingly, the M6PRX's circuit is actually based on that of the flagship Titan, using four pairs of output devices per channel. Musical Fidelity claims the PRX beats most other power amps available, regardless of price. Extremely low, wide-band distortion, low-output impedance, outstanding load-driving characteristics, enormous stability margins and very high-peak current delivery certainly suggests that this mono power amp is really something very special. The M6 combo produces a clean, solid, open and natural sound. The overall presentation is relaxed, yet incisive, with a refined authoritative quality – as though the amplifier was in complete control and completely unfazed by whatever demands might be made by the music. Tonally, the impression is one of neutrality and truthfulness. The music sounds solid and commanding, yet this does not come at the expensive of delicacy or finesse. Bass is very deep and powerful, yet tight and controlled. The lower frequencies possess weight and a suitably rich sonority, while remaining nimble and articulate. The upper frequencies sound clean and open, with good transient attack, impressive fine detail, but no sense of false brightness or added edge. 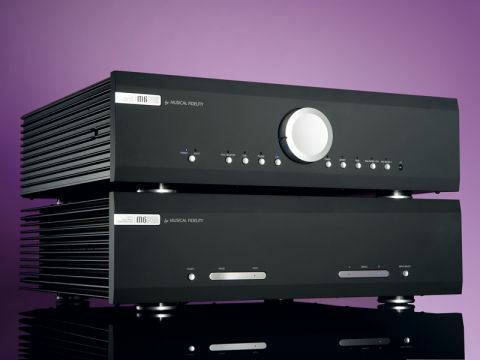 For best results, we strongly recommend balanced interconnects between preamp and power amp, as this gives the sound increased scale and dimensionality. Same goes if your CD player has balanced outputs – investing in a set of balanced XLR cables will ensure the M6 pre/power delivers the best sound quality. Single-ended works fine, but balanced operation sounds noticeably better – bigger and more dynamic, with better separation – and easily justifies the extra cost of special cables. MF's big power amps – like the kW750 – have a solid unflappable quality. Played loudly, they seem able to reproduce sharp transients and massive dynamic swings without flinching. While the M6PRX does not have the sheer muscle of the kW750, it subjectively creates the same aura of unflappable invincibility. You can push the amp hard without ever sensing that it's struggling – though, inevitably, it will hit the end stop if you go too far. For most listeners, playing music in an average-sized room with speakers of reasonable (89dB) efficiency, the M6PRX will (probably) be all that's ever needed. Having a built-in MM/MC phono stage is a nice little 'extra' – and something you don't get on the £8k Primo! Its performance is very good – clean, natural, and quiet. As we've noted already, this preamp/power amp combo is not inexpensive, but it is very keenly-priced – given the standard of build and sound quality. So here's a combination costing around £5k that challenges those amplifiers selling for two or three times its price – a capable and versatile package that offers superb performance and exceptional value. While some tube amplifiers produce a lusher, more romantic sound, you'll search far and wide for one that combines the M6's tonal accuracy and neutrality with ample power. The M6 duo is for those wanting a truthful amplifier – one that neither adds nor subtracts from the source you feed it with. While it's not falsely opulent or beguiling, here is a preamp/power amp set up that does exude a certain smooth natural charm and a clean and unflappable presentation. Sonically, this combination delivers a solid, authoritative quality. It's always smooth and relaxed, rarely showing signs of strain – even when reproducing busy, complex music.